Ethereum was undoubtedly the crypto of the year in 2017. We saw a massive growth since its roll-out. The smart contract capability embedded in the blockchain sets a perfect stage for ambitious developers and entrepreneurs to disrupt every single industry you can imagine. The main use of Ether is acted as “gas” (the fee) to run smart contracts on the Ethereum network. One of the biggest use of the Ethereum network is Initial Coin Offering (ICO) / Token Sales. Numerous start-ups have been issuing smart tokens (that are up to the Ethereum network standard, ERC20) on top of the Ethereum network to raise funding. However, the amount of money start-ups raised has posed concern to some. For example, around USD 35mn was raised in BAT ICO in just 30 seconds and around USD 153mn was raised in BANCOR ICO in 3 hours. People start to question if those companies really need that much funding and the way of sourcing the fund is “fair”. The way ICO works will make start-ups stacking a huge amount of ether in their pocket. If any of the company starts to off-load their stock, it may create a chained effect and topple the price of ether. Larry Cermak of TheBlock did a very interesting analysis of treasuries of different ETH ICOs to see how much funds (in ETH) they have left. 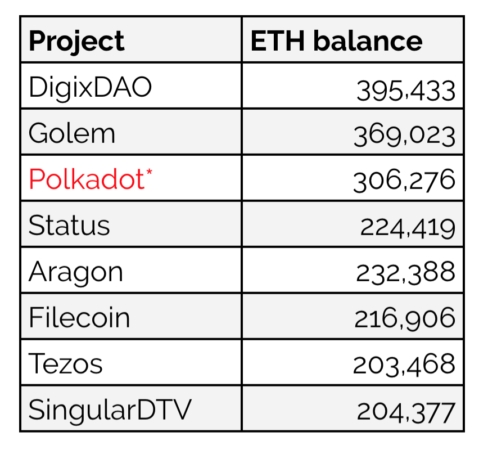 He found that ICOs hold around 3.57 million ETH in their wallets which makes 3.5% of the total ether supply. Even though the unloading of ETH was not as high as some have predicted, Ethereum is far from being cleared safe. The reason for that is not only market conditioned but has a lot to do with SEC decisions. Even though, Ethereum is probably safe from being classified as a security, many of ICOs launched on the platform will almost certainly have contact with SEC. We already saw a road SEC chose to use – they offer ICO teams a settlement with a fine and force them to refund the ICO buyers. As The Block highlighted, the SEC appears to be developing a template for ICO enforcement. It therefore seems reasonable to expect further enforcement action in the near term. Both Airfox and Paragon were fined and agreed to register their tokens as securities. In addition, they agreed to return funds to investors. The large majority of ICOs raised funds in ETH, while a minority also raised in BTC. According to Airfox’s claim form, the companies will have to return the USD value of the purchase price or trading loss, including the interest. The sell off of the ethers ICOs hold is still not happening – they only sold around 2% of the holdings in the last 2 months, 64% in aggregate. But since the majority of projects that held ICOs aren’t generating any meaningful revenue yet, they will eventually be forced to begin selling ETH to cover operating expenses. When that selling happens, or when the SEC forces projects to liquidate their treasuries, ethereum is likely to experience true capitulation.